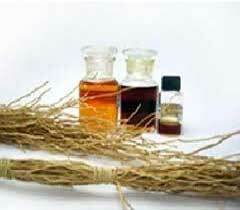 We are actively engaged in providing Vetiver Root Oil to the clients. The dried roots of the Vetiveria Zizanioides plant are subjected to steam distillation process for extraction of Vetiver essential Oil. The oil has earthy sweet woody aroma and has a thick viscosity with balsamic property. The main contents in the oil are khusimol, longipinene, valerenol, epizizanal, avetivone, and b-vetivone. Vetiver Oil is known for its skin-friendly properties and is helpful in clearing heat; nourishing and uplifting skin; and providing a calming effect. It is a quick healer and helps in controlling flow of blood from scars and wounds. Vetiver essential Oil is also very useful for women to treat menstrual and post menopause problems as it stimulates endocrine glands and circulatory system. The Vetiver Essential Oil is known for its sedative properties and is considered extremely effective for getting relief from anxiety, depression, stress, tension, and sleeplessness. The therapeutic properties of vetiver essential oil include sedative, nervine, carminative, stimulant, cicatrisant, antiseptic, aphrodisiac, tonic and diaphoretic.